Finding a place to start on a huge campus can seem like a problem, but having more space to work with can be better in the long run. Try to leave chalk messages on the sidewalk, sneak Post-Its in the bathroom stalls and hang flyers on every cork board possible. Ask professors if you can hang a poster in the classroom. Dressember has a ton of resources online to print out to help raise awareness. Make sure to get things approved by your activities board, first! All of that hard work of hanging things up will mean nothing if they get taken down 10 minutes later. The whole point is to get people to notice what you are doing. If you go to a university, chances are there are tons of students on your campus. Your university probably has events that are heavily attended, and hosting an event can sometimes be the perfect answer to letting people know about the cause. What better way to sit down and explain what human trafficking is than a party, right? If you have food, it makes it even better, and more people will want to come join in on the fun! (We all know college students can’t pass up free food)! Having a big group together can be easier to get a message across, instead of talking to people individually. One of Dressember’s partners is International Justice Mission (IJM). IJM has chapters on multiple campuses nationally. Finding a group already associated with ending slavery can help the process of advocating. Maybe that chapter is already doing something with Dressember, and working together can make the message even better. If they aren’t, maybe they will join you. More people backing a cause gains more attention, and one of the biggest goals of advocating for Dressember is raising awareness. If hosting an event or joining a group doesn’t sound like a feasible option, having more personal conversations can also make a difference. If you only post fliers and host one event, maybe you won’t reach the right people. Sometimes people hear the words, human trafficking, but don’t realize the magnitude of the problem. Taking the time to explain the situation, rather than throwing out statistics, can change the perspectives of the people around you. Social media is everything in this day and age. Campuses utilize Facebook groups for classes and groups. Post to those! What better way to reach the most amount of people than to post to a platform known for bringing people together? Try it out. You never know who will become inspired to get involved. It is better to try and reach people than not try at all. 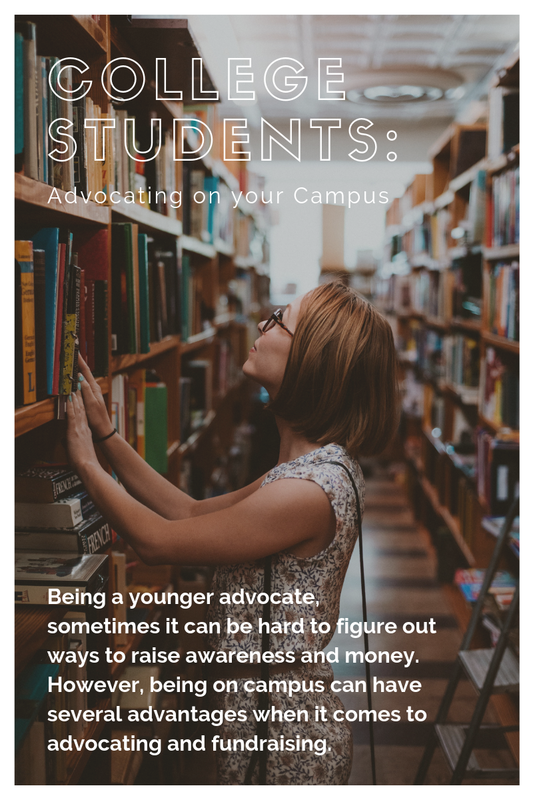 Finding a platform that works best for advocating on your campus can seem hard, but there are plenty of ways to go about doing so. Making your voice heard on campus will inspire others to join in, and also raise awareness for human trafficking. The more people that know about it and recognize the problem, the better. College is the perfect time to find out who you are and what you are passionate about, so being involved with social justice is the best way to connect with like-minded people. At my school, we have a strong anti-sexual assault campaign that also stands behind fighting trafficking. Teaming up with other organizations can have a big impact. We encourage our advocates to challenge themselves and try something new. Be creative, and if you’re feeling hesitant, remind yourself why you started advocating in the first place. Miranda Lintzenich is an analog girl stuck in a digital world. A little quirkier than most, Miranda enjoys 70s music, odd clothing styles, working at her school newspaper and serving pizza on the side.